Fitted, off shoulder sweetheart neckline lace wedding gown. Corset/laceup back. Ivory with light champagne lining. Fits AU Size 12. Designer: Christina Rossi (W0493). I paid $2,999 but selling for $1,250. Comes in the gown bag. Has a bit of a train. 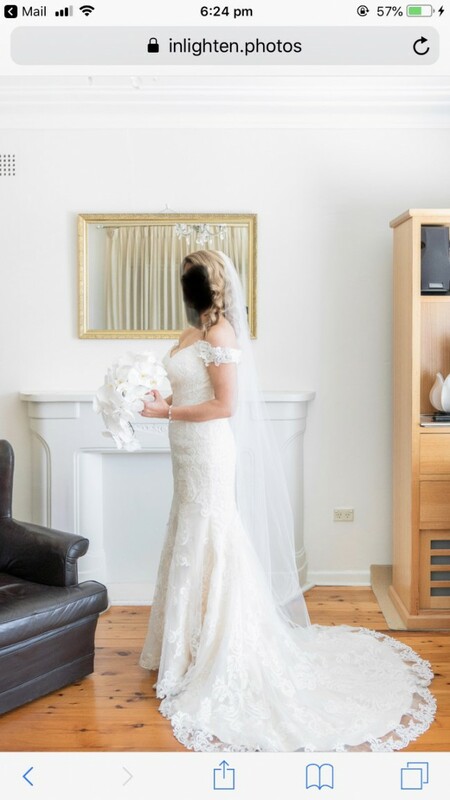 I also have additional items for sale shown in photos if interested (veil, size 12 Rhonda Hemmingway faux fur stole in photos, Roman & French brand earrings, hair clip, bracelet and handbag, & Badgely Mischka wedding heels- (style MP 3215 Rouge) Size 9 ½.). Once you send a message, Kay can invite you to purchase the dress.